Live your life to the max without sacrificing. Prepaid ZTE smartphones come coupled with amazing no-contract wireless plans for data, calling and texting - with amazing pricing. Reviews, Promotions, and Deals on Cell Phones from Verizon, FreedomPop, Net 10, Simple Mobile, Sprint, Straight Talk, Tello, TracFone, Q Link, Twigby, Total Wireless. Free 4GB external microSD card included. 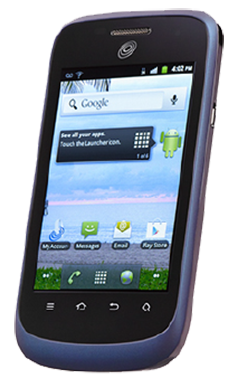 ZTE Midnight Z768G is a 3.5-inch smartphone that comes running Android 2.3 Gingerbread. It's a GSM phone activated on the AT&T network so be sure to check that you have AT&T coverage in your home area before purchasing. It's powered by 832MHz and is 3G enabled. It's a compact device perfect for performing just the basic tasks. ZTE Midnight Z768G is a prepaid smartphone that you can order from Straight Talk for free! You have to purchase a monthly wireless plan though, which I will discuss later in this review. In the box, you will find the 3.5-inch device, battery, wall adapter charger, a standard USB cable, 4GB memory card, activation card, manuals and service guides. This phone is perfect if you are just looking for a device to make calls and perform basic tasks. The ZTE Midnight Z768G design kind of minimal, but it still feels nice given that you get the phone for free. I will go straight to the layout. We have the volume rockers along the left edge. The charging port is located on the right edge. The bottom edge has only your microphone. The top edge has the earphone jack as well as the power button. On the front sits the 3.5-inch display. It includes four navigation keys just below the screen which I found to be kind of unique since most smartphones I have used only have three. The arrangement of the navigation keys is such that, the menu button is on the far left, followed by the home button, then the back button, and lastly the search button on the far right. The back cover has a textured finish which feels good in the palms. 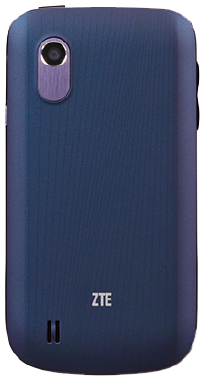 The back cover can be removed to reveal the battery and SIM and microSD slots. The back camera also sits on the upper left side of the back cover. On the ZTE Midnight Z768G, we have only a 3MP back camera which tries to perform well on shots so as to cover for the missing 'selfie' camera. It performs well in bright environments, and you can see some quite good photos. Since it lacks a LED flash, it may not do much in low light backgrounds. Even for this low-end device, the camera includes some nice features, for instance, you can zoom in. It supports modes like Auto, Incandescent, Daylight, Fluorescent, Cloudy, and even Geotagging. The phone comes with a 3.5-inch capacitive display. I didn't find any problem with brightness. Actually, it does show photos and other items brightly while indoors. The screen dims in bright sunlight, but that's expected on low-end phones. The screen responds to touch quite well, and I didn’t find any issues with it. Battery life on the ZTE Midnight Z768G is quite impressive. It has a capacity of 1500mAh which at first one might think is small, but it does give you a talk time of up to 10Hrs and a standby time of 7 days. Given the device handles minimum operations, the battery can last you a full working day. ZTE Midnight Z768G does not perform well on internal storage capacity. It has only 512MB, but it's still a good bargain since the phone is free! Good thing though, it comes with a 4GB external microSD card. The microSD card slot supports up to 32GB so you can always upgrade if you run out of storage space. ZTE Midnight Z768G ships with Android 2.3 Gingerbread. It's powered by an 832MHz processor paired with 512MB of RAM. The resources are quite limited on this device. It does perform well on primary phone operations like texting, phone calls, and checking emails. The phone ensures that you stay connected. It is a 3G enabled phone and I did find browsing to be quite fast. Although due to the limited RAM, I couldn't have many tabs open in the browser. The phone has Google Maps and GPS for live map navigation which is pretty impressive. It comes with several other apps installed ready to use. Sound quality is quite good as well, in fact, I did watch a few YouTube videos which played well despite the compact screen size. Also, it has Wi-Fi so you can connect to hotspots around you. Other connectivity features include Bluetooth 3.0 for quick file sharing. This phone being on the lowest end of entry-level phones, it lacks the high-end specs, but if you just need a device to get by for free, this is an excellent choice. Battery Capacity: 1500mAh. Talk time up to 10 hours. 7 days standby. Internal Storage: 512MB. 4GB microSD card included. It supports up to 32GB microSD card. Dimensions: 4.63'' (H) x 2.42'' (W) x 0.45'' (D) inches.